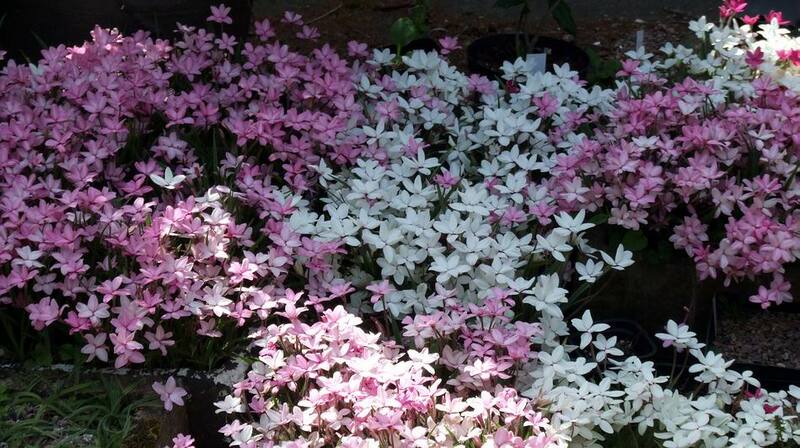 Our Rhodohypoxis in the troughs are growing and flowering very well providing a magnificent display for months at a time. The reason they are growing better is simply because I got round to repotting them this year and while you can get away with not repotting them for a number of years they do much better if the compost is replenished annually. Another contributory factor is that coming from an area of summer rainfall they are feeling quite at home in our wet Scottish summer. Just to let you know that I do not spend all my time poking under the ground with bulbs, I also love trees. The problem is that while I can squeeze thousands of bulbs into a relatively small space it is not so easy with trees - but that has not stopped me trying. 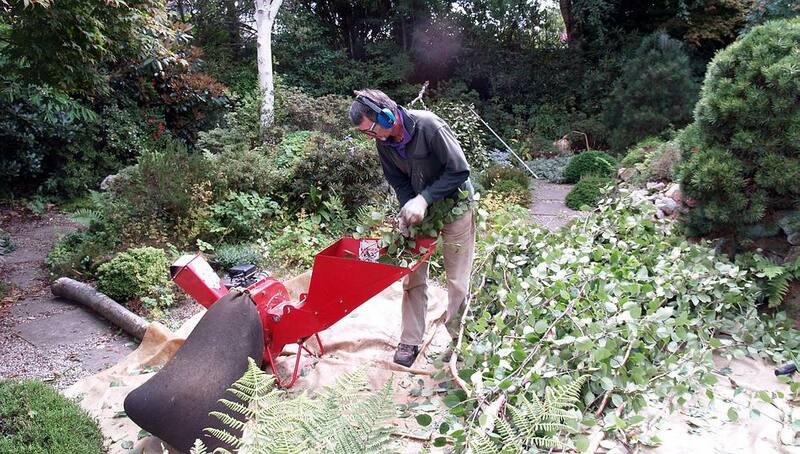 The trees in our garden need to be managed well or else they would take over completely. 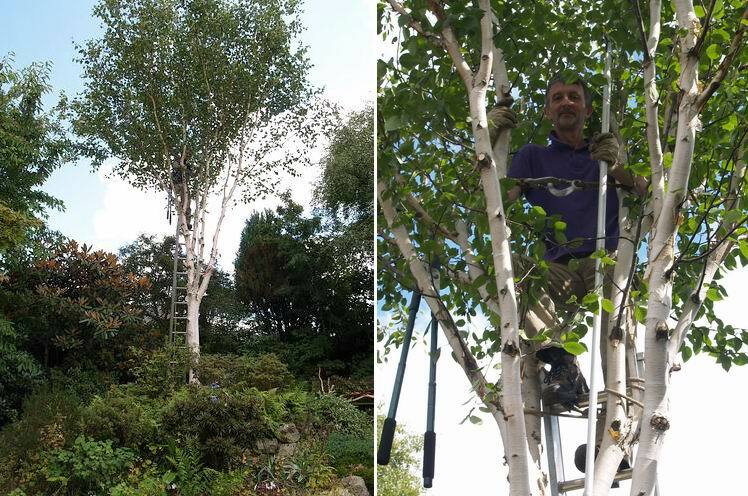 This Betula utilis 'Jacquemonti' has grown too heavy with foliage and needs raising and thinning to allow more light and moisture through to the plants below. On the left is a picture not quite "before", because I had already taken off two large low branches before I remembered I had not taken its picture! On the right is the raised and much thinned out canopy. 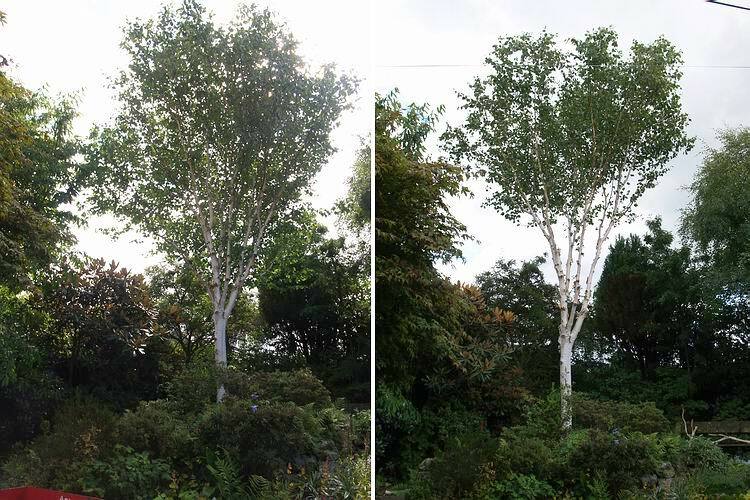 We have still retained as best we can the character of the tree and in fact you can better appreciate the magnificent white bark in the pruned version on the right. is that I am concerned that by speaking of the different planting depths that different bulbs prefer, I may strike panic into some of you and put you off trying. The simple fact is that most bulbs will grow at almost any depth, what I am experimenting to achieve is the optimum depth to get the best performance from the bulbs under our growing conditions. If you are in doubt just start out by planting the bulb half way down the pot and take it from there. 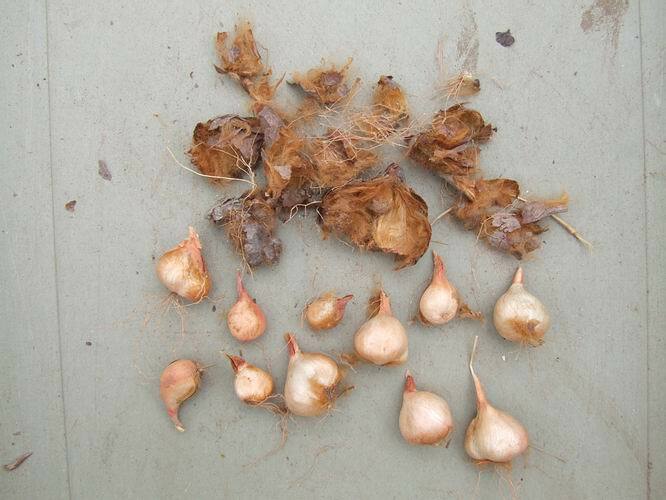 One of the very best ways to discover what depth a bulb prefers is to see what depth undisturbed seedling bulbs have taken themselves down to after three years. These Crocus chrysanthus seedlings are almost at the bottom of this pot so I placed a centimetre of fresh compost in the pot and planted them back at their chosen level - this is much deeper than you would perhaps think is necessary. 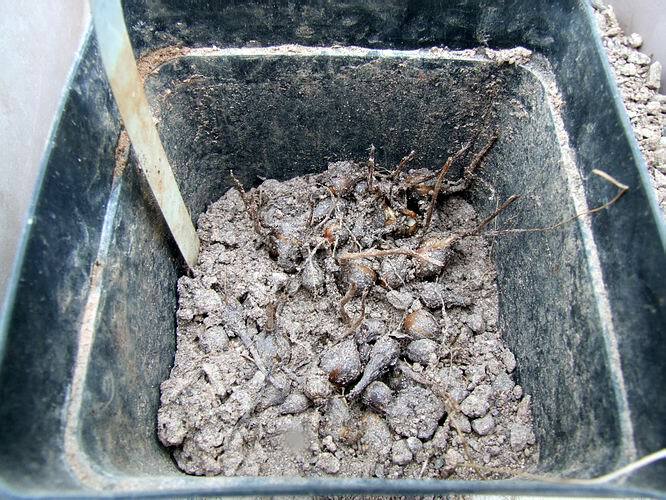 Here are the seedling corms : three to five corms is the typical result I get after three years from a packet of seven to ten seeds. 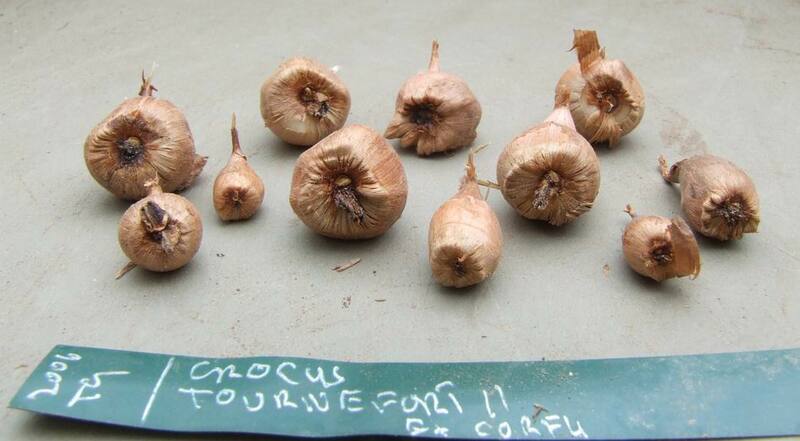 These Crocus tournefortii corms have a very angular shape and a very pronounced rim on their base where the roots will emerge from. 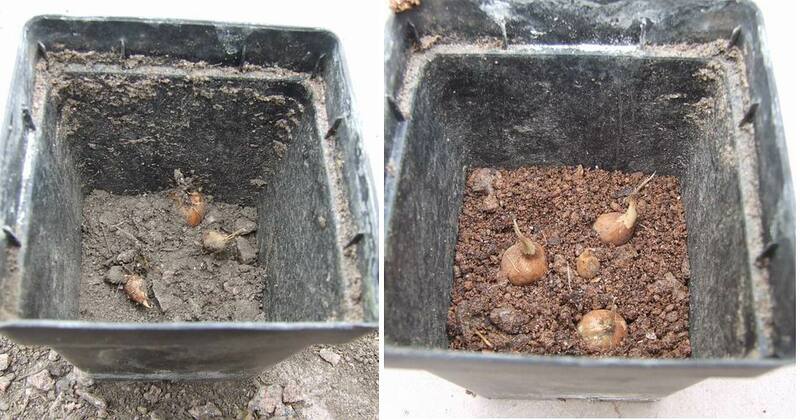 Another point to observe when you are repotting is the orientation of the bulb and again especially when repotting seedlings for the first time. 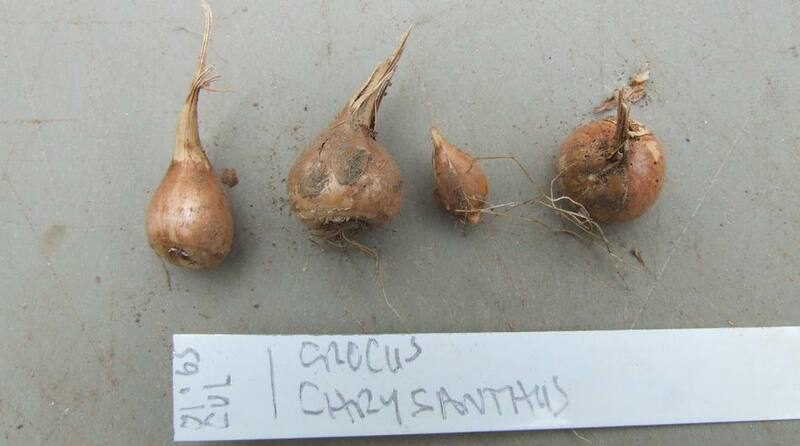 Notice how the shoot on these Crocus kotschyanus hakkariensis corms is to one side - that is because this sub species of Crocus kotschyanus grows on its side in the compost. So to get best results you need to plant it back on its side. That does not mean that it will not grow if you plant it flat - as crocus corms replace themselves each year the new corm will turn itself horizontal as it forms. Narcissus bulbs do not replace themselves like this; they just add more layers getting bigger until they eventually divide into two or more. So if you look at these small Narcissus bulbs which I just scattered in last year you will see that they are still orientated in the same direction that they fell. It does not matter if they are on their side or even upside down, they will still grow and if they are left undisturbed for a number of years they will manage to turn to face upwards. The point I would like to make is do not be afraid to try; just observe your plants carefully as they grow and they will tell you if they are happy or not as well as giving you clues as to what conditions they would prefer. I normally associate this antler like growth with Fritillaria pontica but here it is on some Fritillaria involucrata bulbs. 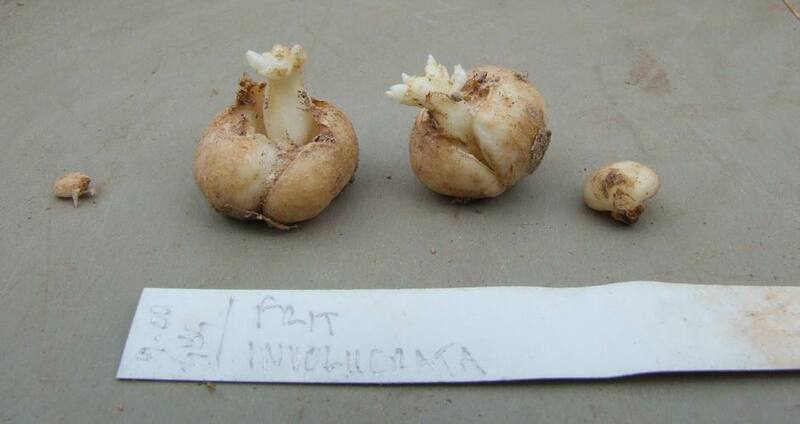 These are seed raised bulbs and there is a possibility of confusion so I have made a note on the label to confirm the identity of these bulbs when they flower. I do this routinely anyway every time a pot of bulbs comes into flower - I check to see that the label corresponds to the plant that is growing as it is very easy to get labels mixed or for stray seeds or rice grains to get mixed especially among fritillaries. 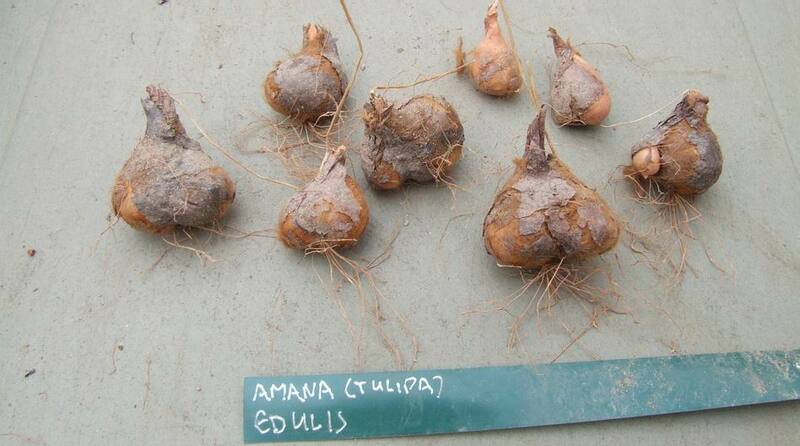 Here is a nice pot full of Amana edulis bulbs or Tulipa edulis as some authorities call it. Like a number of tulips it has a very woolly layer inside the outer tunic. 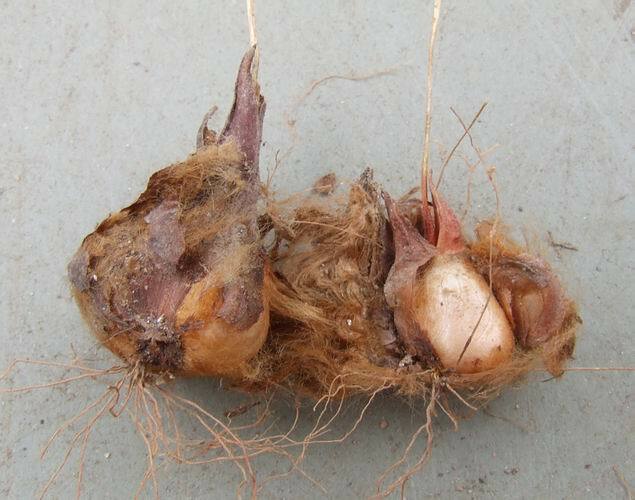 This woolly layer must both insulate the bulb from cold and help to retain moisture in long dry conditions. I do not remove the tunic every year but I was aware that there were a number of offsets inside some of the tunics. I decided they would grow on better if I removed them and gave them their own space in the pot so they were not competing so closely with the parent bulb. This is the kind of decision that makes growing bulbs so rewarding: sometimes what I do works and the bulbs grow better and sometimes it is a mistake and I should have left them alone. I do not mind making these mistakes as long as I learn from them and do not repeat them - that is the challenge and fun so do not be afraid to try. I will leave you with a picture of the lovely Codonopsis grey wilsonii and the white form 'Himal Snow' both growing happily through a Clematis.